Sue Mahlmann is President and founder of Yorkshire Development, the first commercial development company to fund a LEED® standard building for public lease. Founded in 2000, Yorkshire helped transition the Pasadena Planning Department and Pasadena Water & Power to the new LEED® criteria now required for all commercial buildings. Sue has been the Chief Financial Officer of Mahlmann Media Inc., a California outdoor advertising company since 1995, after 16 years in trust management and commercial banking. 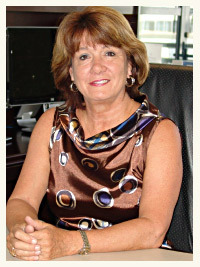 Additionally, she manages Mahlmann Investment Group and is a partner in Detroit Media Group since 2008. Sue looks forward to contributing her efforts to Collective Solutions as they collaborate internationally to teach self reliance and vocational skills related to the development of sustainable products, projects and businesses.